When the author of this harrowing, no-holds-barred memoir held her new-born son Sam in her arms for the first time in January 1986, she didn’t know what the future held for him, and never in a million years could she have dreamed of the nightmare it would become. 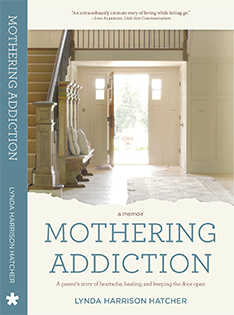 The events chronicled in “Mothering Addiction – A parent’s story of heartache, healing, and keeping the door open” by Lynda Harrison Hatcher took place between 1986 and 2016. With determination and fortitude the author opens her heart, mind, and world to her readers. She admits to being asked by incredulous friends and family why she would want to ‘air her dirty linen in public?’ The reasons? There are many, and they are unveiled layer upon layer as you read the real cost of her son’s drug addiction. As we follow Sam’s childhood, teenage years, and twenties, we bear witness to the terrible destruction addiction can wreak on not only the person who is addicted but also on their family and friends. The anguish of not knowing where your child is, the torment of whether to punish them or not, and if so, how – these are some of the excruciating challenges that millions of parents have to live with on a daily basis. Any mother reading this book will empathise with the pain, guilt and suffering this mother goes through. We all want our children to be healthy and whole, and when the ‘fairy-tale’ life isn’t there, it is natural to look for answers, quick fixes, professionals who can cure the problems, new schools who will understand our child’s problems better. However, the author finds unity in members of her Book Club. This ‘Book Club’ is the name given to a close group of people who recognise the agony of despair behind the eyes of others. See through their masks, charades, and clever answers. Together, behind closed doors, they open their hearts, admit their worst fears, and offer support and understanding to each other. Through humor and humility they discover that they can’t always blame themselves for everything that happens to their children, and that they can’t always ‘fix’ the problems. In unity they find strength. But this book is not all about Sam, his addiction, the heartbreak he put his parents through, the effects it had on his sister; it is about the author. As despair overtook her, she turned to an amazing therapist, Pat Buxton. This incredible woman guided her on a long journey of rediscovery. Joining the author on this road opened my eyes to many things, and made me realise that in our roles of mothers, parents and partners we can easily lose ourselves.